Though it’s hard to imagine now, there was a point when the idea of a portable computer seemed more fictional than a fairytale. Computers took the world by storm as they showed up in offices and public spaces throughout the nation. Owning a personal computer became a luxury few could afford. But what was a coveted household item 20 years ago may soon become a dusty memory. Like typewriters and record players, personal computers have all the makings for the next antique sitting in Grandma’s attic. Although it’s hard for some to imagine a world in which a PC is becoming obsolete, these devices seem to be going the way of land line phone connections. Here are five reasons why. Along with an update in the phone market, tablets are becoming a popular investment. Taking the convenience of a laptop to the next level, a tablet boasts many features that make it a hybrid when compared to a smartphone or laptop. Tablets have impressive computing power at a smaller size. They hold a longer battery life and are lighter than laptops. For those who still want the feel of a standard PC or laptop, devices like a tablet PC can be used along with a detachable keyboard. Back when PCs were the golden standard of computing, they would need to update it as new ones released. This isn’t the case anymore, because instead of replacing the computer altogether, people are able to update their devices. The idea of buying a new device every time they are released seems excessive and unnecessary now. Unfortunately, this is not a time when purchasing a new PC seems sensible. A desktop PC isn’t portable, so the only time it can be used is in one stationary place. A laptop PC has more portability, but it’s heavier and arguably more fragile than a standard smartphone or tablet. This makes these devices impractical and less economical. Though portable devices may seem more expensive outright, they serve as a better investment. In many ways, the PC has become an unnecessary luxury. For the modern culture, it makes less sense to invest in multiple devices when every app or program that will be used can be found on one. We all have cases for our laptops, but during use, they have to come off. A laptop cannot be used in its case and even with screen protectors and other features, PCs are nowhere close to being invincible. If for nothing else, their size makes them an easier target. A smartphone is easier to protect than a laptop or desktop computer. Most people have daily situations that put their devices at risk. Be it a fall, a spilled drink or unexpected elements, accidents happen. Personal computers are not as durable as smaller devices. They are not made to withstand as much and have less options for being protected. Most consumers are paying attention to this and opting for the investment that is easier to protect over time. In the past, the idea of small children and computers did not mix. There may have been one computer in each home but today it is more realistic to have enough to accommodate the needs of each family member, possibly even one device per person. For children, PCs are harder to carry and manage than a smaller device. Even with a laptop PC, it may be too heavy for the child to carry safely or take care of properly. 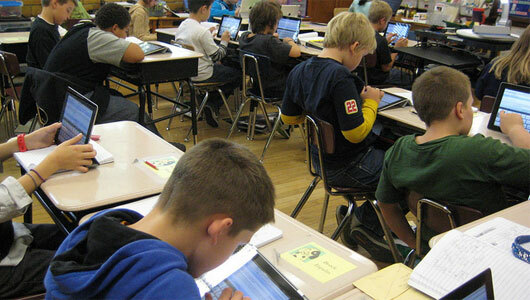 The benefits of teaching children to use devices are endless. Tablets and smartphones give us access to a world of information at our fingertips. This is helpful for studying at a glance, using educational apps or keeping track of assignments for school. The usage can be monitored, and safety features are made available to make sure any tablet is ideal for children. Portable devices are taking over in the same way laptops took over the computer market. With their durability, customizable options and convenience, smartphones and tablets make more sense. They have become the smarter choice for computing needs. Calvin Sellers is a mobile tech and social media trends writer. Follow him on Twitter @CalvinTheScribe.